Game of Thrones legend, screenwriter and producer, George R.R. 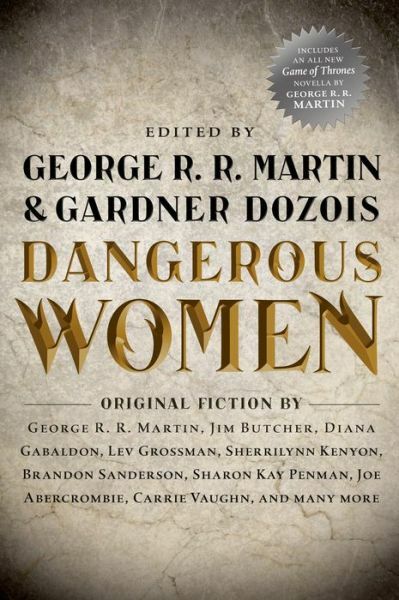 Martin, and Science Fiction Hall of Fame inductee and Hugo Award winner, Gardner Dozois have put together an incredible compilation of tales in Dangerous Women. The twenty-one story anthology features a wide array of modern and historical fiction, sci-fi and fantasy. The authors selected ranged from literary giants, such as Sharon Kay Penman, Lev Grossman, Nancy Kress, Brandon Sanderson, George R.R. Martin, and Diana Gabaldon, to relative unknowns. Shadows For Silence in the Forests of Hell: Written by fantasy legend Brandon Sanderson, who is known for his Mistborn series and for being selected to complete Robert Jordan’s epic Wheel of Time after his death in 2007; this story was a true mix of high fantasy and creepy horror and was one of my favourites in the collection. It followed the tale of a bounty hunter at the edge of a dangerous forest who was willing to do whatever it takes to protect her daughter and her inn. It was riveting, fast paced and it kept me glued the page. Sanderson knows how to put together a good story and this one was fantastic. A Queen in Exile: Sharon Kay Penman, a master of medieval historical fiction, tells the story of Queen Constance and her resilience in the face of rebellion during the later twelfth century. Although this wasn’t one of the more action packed tales, it demonstrated how one woman used politics and intellect to wield dangerous power. Constance took risks and they paid off. She was a force to be reckoned with and I enjoyed this story far more than the other historical fiction pieces in this book. Second Arabesque, Very Slowly: A modern, post apocalyptic kind of tale that features a ravaged and desolate America where tribes roam foraging for food and women are treated as breeding commodities. This story interested me because I love the Hunger Games meets 28 Days Later sort of universes where people are desperately trying to survive after vicious wars or bizarre plagues. The women in this story are treated little better than slaves after a particularly devastating plague strikes and one band decides to fight back to search for beauty and meaning in their horrible environment. I liked the fact that the main protagonist was a simple nurse who wasn’t young and wasn’t fit but in the end, proved to be brave and dangerous. The Princess and the Queen: Lastly, of course, being a huge Game of Thrones fan, George R. R. Martin’s The Princess and the Queen was my obvious favourite. A prequel to the events in the Song of Ice and Fire series, this tale outlines the war for the Iron Throne between two rival Targaryens, Queen Alicent and Princess Rhaenyra. Intrigue, violence and politics in Westeros – who could ask for anything more? It was a great back story to understanding later events. If you’re a fiction fan, or know one, this is a good compilation to pick up. It has something for everyone in it: high fantasy, crime, modern and traditional historical fiction; it covers all the bases. Some stories were misses for me but some that I didn’t think I would find enjoyable turned out to be excellent. I’d love to see more anthologies like this where they explore exceptional characters who aren’t the stereotypical, swashbuckling heroes. This book didn’t fall into that trap and was worth reading.